92-01 HONDA PRELUDE H22 MSD COIL WIRES PLUGS DISTRIBUTOR CAP KIT. Brand New In Box , Never used or Installed Vision / MSD Ultimate Ignition Kit that Includes Vision Motorworks 10.2mm Racing Spark Plug Wires, Vision Motorworks Red Distributor Cap and Performance Rotor , NGK G Power Platinum Spark Plugs , MSD Blaster 2 Coil and MSD Coil Bracket for. 92-01 Honda Prelude H22 DOHC VTEC Engines Only. We Only know that this kit will fit USDM Market Cars , We dont know if the distributor Cap will fit Other Honda or Acura Vehicles out of the United States. The Vision/MSD External Coil Kit Will allow you to Bypass the weak internal Coil that comes from factory on Most Honda & Acura Vehicles. The Vision Motorworks Distributor Cap has a secondary tower that accepts the powerful High voltage from the MSD Blaster Coil. MSD High Voltage Coil Features. 30-50% Higher Energy Than the Stock Coil. Oil Filled For Maximum Cooling and High reliability. Output Voltage 45,000 Volts Maximum. Will Highly Improve Spark Output. Vision Motorworks Spark Plug Wires Features. 10.2mm Wires made of 100% Pure Silicone for Superior Heat resistance and durability. Low Impendance Spiral Core for the Ultimate in Conductivity. Lowest resistance wires available in the Industry. 100% Genuine MSD And Vision Motorworks Products. Vision Motorworks 10.2mm Spark Plug Wires. Vision Motorworks Red Distributor Cap. Vision Motorworks RED Distributor Rotor. Vision Motorworks 10.2mm Coil Wires. NGK G Power Platinum Spark Plugs. NOTE : Kit Doesnt Include Installation Instructions , We highly recommend Professional Installation for this External Coil Kit. Our customers satisfaction is the most important thing to us. We specialize in high performance parts and accessories for domestic and import cars and trucks. We have over 20 years of combined sales experience in the automotive after market field and we stock everything we sell. We export and wholesale not only inside the United states but all over the world! ALL emails will be answered in within 24 hours. The item "VMS RACING 92-01 HONDA PRELUDE H22 MSD COIL WIRES NGK PLUGS DISTRIBUTOR CAP KIT" is in sale since Wednesday, April 22, 2009. 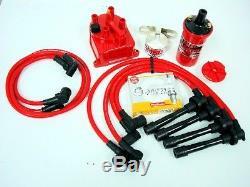 This item is in the category "eBay Motors\Parts & Accessories\Car & Truck Parts\Ignition Systems\Coils, Modules & Pick-Ups".